Five games and five losses to open SEC play for Kentucky. The Bat Cats drop game two to No. 13 Texas A&M 9-3 to lose their second straight weekend series. Texas A&M made sure to jump on the Kentucky pitching early, scoring a run in each of the first two innings then added two more in the fourth. The backbreaker came in the fifth on a three-run home run by Mikey Hoehner to give Texas A&M a 7-1 lead. Kentucky tried to battle back with two runs in the seventh started by Elliott Curtis’ first career home run. After Curtis’ home run Austin Schultz would score on a throwing error after his double, but it was too little too late as the Aggies tacked on two more to win 9-3. It was not a banner day at the plate for Kentucky, as every starter struck out at least once in a 17-strikeout effort. Texas A&M starter Asa Lacy was on the right side of 13 of those strikeouts through six innings of work. Dalton Reed and Coltyn Kessler had the dreaded hat trick. Outside of Curtis’ home run, the only other bright spot in Kentucky’s lineup this afternoon was Jaren Shelby who had two hits including an RBI-single in the first inning. A bright spot came on the defensive end as well for the boys in blue as Cam Hill tried to outdo his outfield counterpart, Jaren Shelby, with a diving catch of his own. Grant Macciocchi dropped to 1-2 as a starter this season. He gave up ten hits and seven runs through five innings of work. Kentucky will try to break through in the win column in conference play tomorrow afternoon for the final game of the weekend series with Texas A&M at Kentucky Proud Park. First pitch is set for 1:00 p.m. if you can’t make it out to KPP, you can watch the game on SEC Network+. Kentucky is now 14-9 on the year. After getting swept to open up SEC play, Kentucky looked to get in the winning column in conference play against Texas A&M this evening. Unfortunately, the Bat Cats are still winless in conference play as they lose the SEC opener at Kentucky Proud Park 5-3. After jumping out to a 3-0 lead in the first three innings and Zack Thompson on the mound, Kentucky looked to be in their bag early. But, Braden Shewmake was Kentucky’s Kryptonite. In the top of the fifth, the All-American for the Aggies hit a two-run shot to tie the game at three. The Cats pulled Thompson in the seventh for Carson Coleman. Then, Shewmake struck again when he gave Texas A&m their first lead of the game on an RBI single. The Aggies would tack on one more in the seventh to take a 5-3 lead. Shewmake finished the game with three hits and a home run with three RBIs. Thompson ended the day giving up three runs on seven hits through six innings of work. He also had nine strikeouts in the no-decision. Kentucky would get the tying run to the plate in the ninth, but the Cats weren’t able to get it done as they lose 5-3 to drop to 14-8 on the year. Coleman was credited with the loss. Despite the loss, Ryan Shinn had a career day against the Aggies as he was the only offense for the boys in blue tonight. In the first Shinn put the Cats up early with a solo shot in the first. Shinn wasn’t done as he went yard again in the fifth inning for a two-run shot to be the first player to have a multi-home run game in Kentucky Proud Park. Kentucky had plenty of opportunities to help Shinn, as the Cats left runners in scoring position four times in the loss. While Kentucky struggled on offense, Jaren Shelby had the play of the night for the Cats. Expect this play to be on Sports Center tomorrow morning. Kentucky will have another crack at Texas A&M tomorrow at 2:00 p.m. ET for Bark in the Park at Kentucky Proud Park. Bark in the Park will also be going at the same time at John Cropp Stadium as well for softball. For more info on Bark and the Park, you can check it out here. If you can’t make it to KPP or John Cropp stadium, the games will both be on SEC Network+. Last season when Kentucky took on Xavier, it was the first game in the final season of The Cliff. With a packed house on an unusually warm February night, Xavier beat Kentucky 3-2 in extra innings to deflate the send-off of Cliff Hagan Stadium. This season, Kentucky got back at the Musketeers by welcoming Xavier to Kentucky Proud Park with a huge 16-3 victory. As evident by the final score, hitting was contagious in what was Kentucky’s best offensive performance this season. This performance was lifted by four big blue bombs and eight of Kentucky’s starters getting a hit. The four home runs matched Kentucky’s high against Austin Peay in the season opener. The most significant bomb came from the senior infielder Alex Rodriguez. It was the first home run of his career in the blue and white. A-Rod would also record a career-high four RBIs. Of course, it wouldn’t be a Kentucky home run derby without T.J. Collett, who blasted a three-run shot for his seventh home run of the season in the bottom of the fifth to make it a 10-run lead for the Cats. Directly after Collett was Jaren Shelby, who decided to get in on the fun as well to make it a 14-3 lead for the Cats. Breyon Daniel would cap off the home run party with a solo shot in the seventh to give Kentucky a 15-3 lead. The Cats would tack on one more on a bases-loaded walk in the eighth. The big lead meant that Kentucky got to utilize their bullpen a lot last night, as Mingione sent nine Cats to the mound. Alex Degen got the start, going only 2.2 innings, but it was sophomore right-hander Trip Lockhart who was credited with the win. When Lockhart entered the game in the third, the Musketeers were threatening with the bases loaded, but Lockhart was able to catch the batter looking to get the Cats out of a jam. Lockhart went 1.1 innings. The Johnny All-Staff performance for Kentucky only gave up three runs on four hits. Despite walking seven batters, the Cats were able to strike out 14. Kentucky will be back in action for game one of a weekend series against No. 13 Texas A&M at Kentucky Proud Park. First pitch is set for 6:30 p.m. ET on SEC Network+ or streaming on UKathletics.com on the UK Sports Network. Overall, they didn’t seem too upset. The team must have been practicing when the news broke on Twitter, because Murray said their coach told his players he had a “surprise” for them. Of course, this surprise was an early peak at their bracket. For Morris, it was a relief. “I’ve been anxious to find out who we play and where we’re going, so finding out a little sooner wasn’t too bad,” the guard laughed. This year, the team wasn’t necessarily worried about whether or not they’d make the tournament – Coach Mitchell said they felt pretty confident they’d qualify after earning their eighth conference win back in mid-February. Instead, they were really just interested in their opponent and their location. And besides, mistakes happen. A year can make a huge difference. Last year on Selection Monday, the Kentucky Wildcats did not hear their name called – plus, there was no bracket leak to soften the blow. Mitchell recalled the “crushing” experience. Fast forward to a year later, and the Cats have earned a No. 6 seed in the 2019 NCAA Tournament. The results of last year’s hard work didn’t culminate in a 2018 Tournament bid, but it did carry over throughout the off-season and into this year. Two years of hard work made today even sweeter, according to the Wildcats’ coach. This year, there are only a few competing players on the roster who have even experienced post-season play. What do these two particular veterans tell their younger teammates? Very. Kentucky hasn’t played in a game since March 8, when Missouri beat them 70-68 in overtime to advance in the SEC Tournament. While ten days may not seem like a long time away from the game, it’s a lifetime compared to the rigor of conference play. Mitchell said he gave his team three whole days off to rest and recover after the loss, then it was back to business. But those few days off were a huge help, according to Mitchell and his players. He went on to discuss the team’s effort after their short break, saying they were more energetic, more enthusiastic and just had more of a “pop.” During this time of the season, where there’s the possibility of playing multiple games in a very short period of time, that’s more important than ever. The time off also helped Morris get back into the swing of things, after a minor leg injury affected her performances during the back-half of the season. As the team heads into the Tournament, Mitchell is confident she’ll be back to 100 percent. As for Morris, she’s feeling pretty good about herself, too. The No. 11 Princeton Tigers. Coach Mitchell says he knows their coach, Courtney Banghart, well, but he hasn’t had the chance to catch a Princeton game yet this year. Starting tonight, that’ll change. The Cats got Saturday’s early game: they’ll face the Tigers at 11 a.m. on ESPN2. A mixup in ESPN’s graphic department may have ruined the surprise, but the women’s basketball Selection Monday show has now made the bracket official: the No. 6 Kentucky Wildcats will take on No. 11 Princeton Saturday. The game will be played in Raleigh, North Carolina and is set to tip off at 11 a.m. This year marks the Wildcats’ 15th NCAA Tournament appearance. UK’s bracket also features No. 1 seed Baylor and No. 7 seed Missouri. The Cats defeated Mizzou 52-41 at home during the regular season, but the Tigers came back with a vengeance in the SEC Tournament. No. 5 Missouri narrowly defeated No. 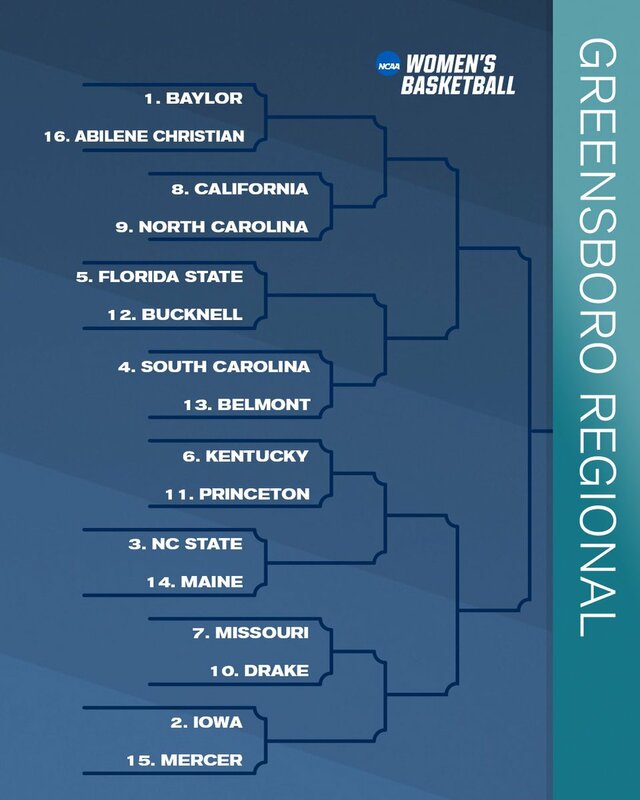 4 Kentucky 70-68 in the quarterfinals of the conference tournament in Greenville, South Carolina. What looked like a positive start for Kentucky in SEC play after game one turned sour quick. Kentucky is off to a disappointing start in conference play as they got swept this afternoon, losing to LSU 7-2. Dillion Marsh was off to a stellar start, giving up no hits through three innings, but ran into trouble in the fourth when LSU loaded the bases on two hits and an error. Marsh would give up a run on a fielders choice then Cole Ayers came to relieve him with a one-pitch double play. Kentucky would strike back in the fifth with a perfect sac-bunt from Marshall Gei, but LSU deflated UK’s momentum in their next at-bat, scoring three runs off Hunter Rigsby and Cole Daniels in the fifth. LSU would tack on three more in the seventh that made the deficit seem insurmountable. But, T.J. Collett wasn’t finished, hitting his sixth home run of the season in the eighth. Unfortunately, Collett’s home run was the only offense for the Cats the rest of the way, and the Cats would lose 7-2 to suffer their second sweep of the season. There were not many bright spots this weekend for Kentucky offensively outside of Austin Schultz. The freshman racked up five hits in two games this weekend, including two this afternoon. Kentucky will return to the diamond Tuesday night when they take on the Xavier Musketeers at Kentucky Proud Park at 6:30 p.m. in the only midweek game this week. Per usual, you will be able to catch the game on the SEC Network+, or you can listen on UKathletics.com on the UK Sports Network. The Bat Cats are now 13-7 on the year. 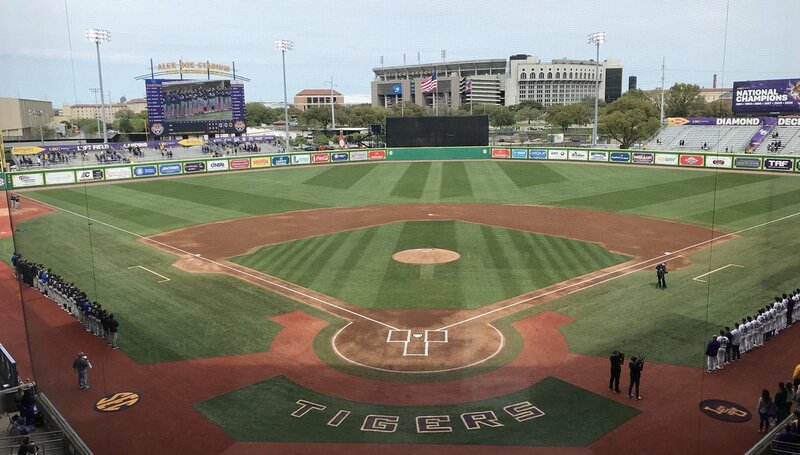 After the Bat Cats nearly beat LSU in game one of yesterday’s doubleheader, losing in extra innings, they did not put up a valiant effort in game two. Kentucky lost 16-4 to the Tigers. After a stellar defensive performance in game one, the nightcap was a COMPLETELY different story. LSU piled up nine runs in the first three innings, and only three of them were earned. Grant Macciocchi gave up eight hits and 11 runs in his short 3.1 innings of work. The bullpen didn’t fare so well, either. As a whole, Kentucky walked eight batters and struck out just five. It’s pretty hard to win baseball games when you do that. Macciocchi was credited with his first loss of the season. Offesnsivley, the Cats didn’t do too shabby. Kentucky strung together 11 hits and put up four runs, but holes in the lineup hindered the Cats in this one as they left 13 men on base. Ryan Shinn, who has been red hot to start the season, went 0-5 to end his on-base streak at 17 games. Jaren Shelby also went 0-5 with a hat trick on top of that. On the bright side of things, Kentucky got great production from their young middle infielders. Elliot Curtis saw the ball really well last night going 3-3, and Austin Schultz went 3-5 with two doubles and an RBI. T.J. Collett also had a pair of doubles. Despite failing to get a hit in this one to end his career-high hitting streak, Coltyn Kessler reached base to extend his on-base streak to 14 games. After a long day of 21 innings, and falling to 13-6 on the season, Kentucky will be back in action again this afternoon at 3:00 pm from Baton Rouge. You can catch the game on SEC Netowrk+ or listen on UKAthletics.com on the UK Sports Network. As Kentucky and Tennesee tipped off in Nashville, the Bat Cats kicked off their first series in SEC play falling to No. 10 LSU 2-1 in Baton Rouge. The key for Kentucky in this one was their ace Zack Thompson who completely shut down the Tiger offense. Thompson started the day on the mound with a one-run cushion after T.J. Collett got an RBI single in the first that later saw Kentucky leave the bases loaded in the opening frame. Thompson dealt with that short cushion all day and pitched a gem, going six innings and fanning nine batters along the way. Thompson also gave up four hits and no runs. After his departure in the sixth, the young Cats bullpen held their own against the Tigers, only giving up two hits the rest of the way. However, Jimmy Ramsey couldn’t pound the zone in the eighth inning, walking three straight batters to allow the Tigers to tie it up in the eighth and the game would go into extras. Kentucky would have their chances in extra innings, getting Elliot Curtis to third with two outs in the tenth inning, and getting Breydon Daniel to third with one out in the 12th. But, Kentucky couldn’t knock them in, and LSU would walk it off, literally, after Ryan Johnson walked Giovanni DiGiacomo to allow the Tigers to escape 2-1. Trip Lockhart was credited with the loss. There has been a big question mark for Kentucky this season, outside of Zack Thompson and T.J. Collett. Besides Collett and Thompson, Kentucky lost their entire starting lineup, then brought in 18 newcomers. Many people suggested that the Cats may not have a stellar season due to their inexperience and the fact that the SEC is absolutely loaded this season with 11 teams in the top 25. But, despite losing to LSU in 12 innings, Kentucky put their best foot forward this afternoon to kick off SEC play. Kentucky is getting another crack at LSU, right now. Game two is underway on the SEC Network+. The Bat Cats are in store for at least 21 innings of baseball today. Kentucky finishes up their lengthy opening homestand with a 15-0 beatdown of Western Kentucky this afternoon at Kentucky Proud Park. This game was ugly from the start, after three errors to start the first three UK batters today, TJ Collett hammered a three-run shot before the Hilltoppers could even a record an out, and that would set the tone for the rest of the game. WKU would get two more errors in the inning that allowed Dalton Reed to score, and Rook Ellington to get an RBI as well. Also in the first Coltyn Kessler extended his hit-streak to a notable 11 games. Collett wasn’t finished with his home run either. In the seventh, the Cats busted it open on a TJ Collett triple (yes, you read that right) that scored Ryan Shinn after his double, and Breydon Daniel. Then Jaren Shelby knocked in Collett with a single, followed by a Coltyn Kessler double that scored Shelby. Dalton Reed also had a four-RBI day at the plate, with a two-RBI single in the fourth and another one in the seventh. Keeping with a couple of active streaks for the Bat Cats: tonight Ryan Shinn extended his on-base streak to 16 games, Coltyn Kessler extended his hitting streak to 11 games, and Jaren Shelby has reached base safely in 11 straight games. Kentucky won today throwing six pitchers. The first seven innings were tossed by freshmen; the final two were by sophomores. Kentucky’s pitching and defense were near immaculate this afternoon with no walks or errors. Dillon Marsh was near perfect on the mound going four innings in the start, facing the minimum and only allowing a hit. He finished with three strikeouts as well. Ben Jordan would relieve him and continue the Johnny-all staff one-hitter through five. Then Tyler Burchett would carry that through the sixth. WKU finally broke the minimum curse in the seventh inning when they got two hits off Braxton Cottongame. Those hits were WKU’s first since the second inning. Brett Marshall and Trip Lockhart would finish the Hilltoppers in the final two innings. Not only was the pitching amazing, check out this Jeter-jump throw from Austin Schultz. Stop it, @AustinSchultz23! Just stop it! After having to come from behind to win most of their games to start the season, it was emphasized that the Bat Cats needed to get out to a lead early, and it all finally came together this afternoon. Not only was getting out early a good sign for the Cats before they head to Baton Rouge to face the preseason number one team in America LSU, but Kentucky got production from top to bottom in the lineup in these two-midweek games. Last night it was the bottom of the lineup that put together the comeback that enabled the Cats to win, and in this one, the first six guys in the lineup either scored or had an RBI. On deck for the Cats, they will make the trip to Baton Rouge this weekend to begin SEC play against the No. 13 LSU Tigers. First pitch will be Friday at 8:00 p.m. You can catch the game on SEC Network+ or 98.5 FM Lexington on the UK Sports Network. What a way to end a series sweep for the Bat Cats. In Game two of today’s doubleheader against Middle Tennessee State to close out the series, the Cats entered the ninth inning down by a run. Looking for their third sweep of the season, the Cats sent their nine-hole hitter Austin Schultz to the plate with the lineup set to roll over. He got on after an impressive two-strike single, then a sacrifice bunt later and Ryan Shinn looking to extend his on-base streak to 13-games…Santa Maria! Shinn’s walk-off ended an 18-inning day of baseball, one that saw Grant Macciochi and the Cats post a shutout in the first game on Sunday. Macciochi went 6.1 perfect innings until giving up a hit in the seventh inning. He improved to 2-0 on the year. Jimmy Ramsey got the win in the second game; after entering in the sixth, Ramsey went for three scoreless innings. Jarren Shelby had a big day Sunday as well. Over both games, Shelby had multiple hits and four RBIs – none were more significant than a three-run double in the seventh inning of the first game to bust the matchup open for the Cats. Coltyn Kessler had a hit in both games as well to extend his hitting streak to nine games. The Cats now sit at 11-4 on the year: they won 7-0 in the first game and 5-4 in the second. They’ll be back in action Tuesday against SIU-Edwardsville. First pitch at Kentucky Proud Park will be set for 4:00 p.m.
After a late-game debacle on Wednesday night, the Bat Cats are back in the win column with a 4-1 victory over Middle Tennesee State. Zack Thompson was dominant yet again in this one. The lefty went a career-tying seven innings only giving up four hits, one run, and he had nine K’s. For the first time in his 24-start career, Thompson did not walk a single batter in his start. He also sat down the last nine batters he faced. Thompson is a top-20 draft prospect for a reason, and he has been dominant all year. He alone will be able to win Kentucky some games this season. Dillion Harper would get the hold in a one-hit seventh inning, and Jimmy Ramsey got his first career save with a perfect ninth inning. On the offensive side, It was Cam Hills two-run blast that gave Kentucky their first lead of the game in the fourth. It was Hill’s first career home run. Bryedon Daniel who has been hot lately went yard as well to give Kentucky a 3-1 lead. That lead would get extended in the sixth when Zeke Lewis executed the rare suicide squeeze that scored Coltyn Kessler to put the Cats up 4-1. Ryan Shinn also kept his on-base streak alive to make it 12-straight games, and Kessler extended his hit streak to seven games. Kentucky will be back in action today, at Kentucky Proud Park. First pitch for game two of this series is set for 1:00 p.m. ET. After Kentucky went on a five-game win streak to open up their new home, the Bat Cats looked like they had game six in the bag, but they blow the late lead and lose to Boston College 12-2. Kentucky had a 2-1 lead with two outs in the eighth inning, but Boston College was threatening with bases loaded when Jimmy Ramsey gave up an infield single, that allowed two runs to score to give Boston College a one-run lead late. The Cats would end the top of the eighth down by three with two innings to make a comeback, but unfortunately, the Eagles hung a seven-spot in the top of the ninth to essentially end the hopes of late-game heroics. Before the late-game debacle, Kentucky looked pretty solid with a Johnny All-staffer, only giving up one run until the eighth. TJ Collett kept proving he has one of the best bats in the SEC with yet another home run this afternoon. He now has seven extra-base hits along with 16 RBIs and a slugging percentage of .596. What a monster. Ryan Shinn’s on-base streak got in jeopardy in this one, but he was able to come through with a double in the eighth to extend his on-base streak to 11 games. Coltyn Kessler has put together a nice little hit streak as well; he is now sitting at a career-high six games. Kentucky will return to the diamond on Friday at 4 p.m. ET when they host Middle Tennessee in the opener of a three-game weekend series. Saturday and Sunday’s games are set for 1 p.m. first pitches. All three games will be aired on SEC Network+ or you can listen on UKathletics.com.